Most one sided win ever? Stop it or you will go blind! 3 2 months to go until Australia's Number 1 chess tournament, the O2C Doeberl Cup, begins. As with the last couple of years the main interest, and the early entries, have been concerntrated on the Premier Section. As of today there are already 32 players entered into this tournament, and with a size limit of 90 players, it means there is only room for another 58 entries. There is still plenty of room in the other events (U/2000, Under 1600 and Under 1200), although there are size limits for these tournaments as well. In terms of the strength of the fiels the Premier already has 11 GM's and 6 IM's. Once again there is a sizeable contingent from India, and it looks like some of the players who mplayed last year enjoyed the event so much they are coming back again. If you wish to enter the tournament (or just see who else has entered) just click on the link to the tournament website and choose the appropriate heading. Advantages may change during a game, or may even be overruled by an endangered position of the king, or by the factor which has thus far been neglected in theoretical works: Time. This dynamic factor should be included in any chess system if we want to call it conclusive. 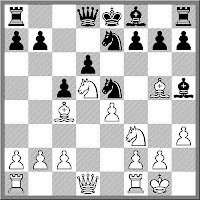 The reviewer observes that time has been considered by other recent writers, including Jonathon Rowson in "Chess for Zebras". In fact 'time' as a specific chess concept pre-dates even that with Larry Evens devoting a chapter to it in his book "New Ideas in Chess", first published in 1958. In the chapter on time he give some opening analysis which I had not previously seen. 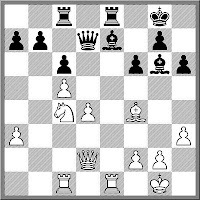 After the normal moves of the Two Knights Defence 1.e4 e5 2.Nf3 Nc6 3.Bc4 Nf6 4.d4 exd4 5.0-0 Nxe4 (D) he quotes some Soviet analysis which suggests that 6.Nc3 may be playable. He goes on the recommend the safe reply 6. ... Nxc3, reasoning that as Black is ahead material, he should catch up in time. He gives as a footnote the obvious line 6. 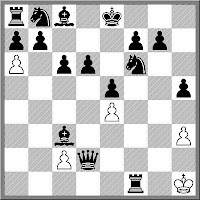 ... dxc3 7.Bxf7+ Kxf7 8.Qd5+ Ke8 9.Re1 Be7 10.Rxe4 d6 11.Bg5 with the conclusion that Blacks faces a fierce attack. All very true, but sadly it is time (and the development of strong computer programs) that have caught up with this analysis. These days plugging this position into Fritz would quickly reveal that Black can hang on, no matter how scary the position looks. The 8th Gibtelecom Masters is underway in Gibraltar. As usual the Masters section is crammed with GM's head by French GM Etienne Bacrot. GM Michael Adams is also taking part in the big swiss (and currently shares first place), which is a little bit of a surprise, as up until last year he was more of your 'Elite GM Round Robin' player. The only Australian player in the field (that I could spot) was Ibrahim Ogada-Osir who is on 1.5/3, along with a popular visitor to these shores, Henrik Mortensen. While the homepage for the event is top notch as always, the organisers have added a little extra with live video feeds of GM Stuart Conquests commentary. The link for this feature is here, and the action should begin at Midnight Canberra time. 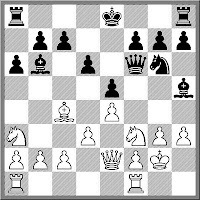 Detailed calendars for each club can be found at Ian Rout's chess page. Sometimes you get into a 'drawing rut' and no matter what you do, you can't seem to get out of it. Depending on who you are it may be your fault (happy to draw with higher rated opponents) or the fault of your opponents (happy to draw with you). In the current Corus tournament, World Champion Viswanathan Anand has halved the point in every game he has played so far. Given his title and rating, I suspect this doesn't make him as happy as it does his opponents. At the top end of the tournament Shirov is still in first place, tied with Vladimir Kramnik, who joined him after defeating Magnus Carlsen in Round 9. World Under 12 Champion Bobby Cheng is the new Australian Junior Champion, the youngest in the tournaments history. He scored 10/11 finishing ahead of Andrew Brown on 9/11. The decisive game between the 2 players was in round 6, which Cheng won, as both players finished the event with 4.5 points over the last 5 rounds. In the under 12 Championship, top seed Andrew Pan totally dominated the event with a Fischer-esque 11/11. Second placed Joshua Behar finished a full 2.5 points back. The girls championship was won by Leteisha Simmonds after defeating Abbie Kanagarajah in the playoff for the title, after both finished on 8/11. The under 12 girls championship saw another perfect score after Savithri Narenthren scored 9/9 in the 10 player event. Full standings and title winners in the other age groups can be found at the tournament website. Rooks usually belong on open files, and the normal script is (1) open file (2) stick rook on it. Sometimes you reverse the order, especially if you are playing uber-positional chess, in a Karpovian style. 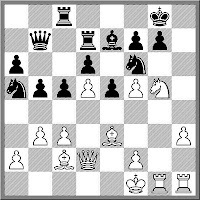 However putting the rook on a closed file as an attacking move is a much rarer thing instead. Worth revisiting my policy on comments/spam on my blog, for lose who came in late. The comments section to this blog is not moderated, which means that any comments added to a post appear immediately. It is also possible to post anonymously in the comments section, and not only is their no restriction on this, the posts are truly anonymous (ie I do not know who has made an anonymous post). Of course you are able to (and encouraged to) identify yourself in any post you make, especially if you are looking for a reply from me. While I think the mark of an interesting blog is interaction between author and readers, I have a personal policy of not responding to anonymous posts (even when I really, really want to). So you have the freedom to post anonymously, I just exercise my freedom to ignore you. Of course this policy does allow spam to pop up in the comments section. This has become more frequent recently. Some of it is relatively innocuous (such as the banal 'I think your blog is better now' type 'testing' posts to see if I am moderating), to the annoying 'come and visit my possibly criminal website'. In the end I'm not going to pull these posts as you can simply skim over them, or see them for the dross that they are. As for comments which may be abusive or offensive, they seem to be a rarity on this blog (especially compared to foums which have a moderation policy that professes to deal with them). Again I wil leave them there, although I do sometime attach a *not safe for work* tag the post, again leaving up to you own judgement about what you can and cannot read. Overall, while the amount of comments on this blog are fairly light, they are normally pretty good, and I encourage anyone with a point of view to add to the debate. I was doing some research recently for some coaching material, and I came across the following strange game. 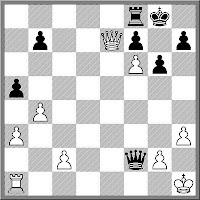 While everything up to move 18 or so looked ok (from 19th century standards) the game came to a sudden conclusion on move 20 when White played a move that allowed a mate in 1. And it wasn't a case of missing the threat and failing to prevent it (eg Kramnik v Deep Fritz), but actually playing a move that allowed the mate. Now given the reputation of the players involved, I'm wondering if anything similar has occurred in top level modern chess. The clash between Carlsen and Nakamura at the current Corus tournament was probably interesting due to the apposite styles of the two players. In their round 5 game Nakamura (the aggressive American) went for a solid variation of the Ruy, while Carlsen (the technical European) sac'ed a piece for 3 pawns in the middle game. 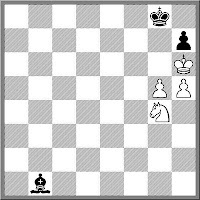 Eventually the game was drawn when the players reached bishop v knight ending where all the pawns had come off the board. The American media put another spin on the clash however. To the LA Times, this was a clash to mirror Ali v Frazier. (To be fair it actually reads "the Ali-Frazier of chess?" where the 'Fox News' question mark is thrown in to avoid taking responsibility for the actual statement). This post by blogger Peter Nichols focusses on the rivalry between Carlsen and Nakamura, as well as the differences between European and US chess. But ultimately it was Carlsen himself who put the 'rivalry' into perspective, observing that with Nakamura ranked 28th in the world, his real rivals were higher up the rating list. Nonetheless he was diplomatic enough to suggest this may change in the future. Looks like Alexei Shirov has no intention of slowing down, having kicked of the Corus tournament with 4 wins from 4 games. His latest victory was over Jan Smeets and he now holds a full point lead over Nakamura, Ivanchuk and Carlsen. But not only is he winning, but he is doing it in a style that harkens back to the 'Fire on Board' stage of his career. While the Petroff is often played by Black has a way of holding sterile equality (everything gets exchanged on the e file) Shirov eventually finds a sacrifice on move 26. And to prove that most of all chess is a practical game, Smeets' could have defended with a better 33rd move, but did not, allowing Shirov to crash through. I've had a couple of different non-chess people mention Chess-Boxing to me in the last few days, so clearly it's appeal is starting to spread. For the uninitiated it is a combination of chess and boxing, with a round of boxing followed by some chess moves, then boxing then chess etc. You win by knockout or by checkmating your opponent. As they use a chess clock, you can also win on time (at chess) but not points (in boxing). English comedian Paul Mertons visited Berlin to see what a Chess-Boxing Club looks like in this video, which sheds some more light on this growing sport. At this point I don't think it has reached Australia, but if it does, I would suggest that Canberra player (and boxer) Shervin Rafizadeh would be a good person the bet on. 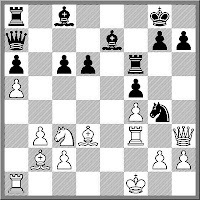 Legal's Mate (1.e4 e5 2.Nf3 Nc6 3.Bc4 d6 4.Nc3 Bg4 5.h3 Bh5 6.Nxe5! Bxd1 7.Bxf7+ Ke7 8.Nd5#) is fairly well known, and the idea can be used in a number of similar, not just exact positions (eg I won a game at Olympiad with the tactical idea even though it began as a Sicilian). 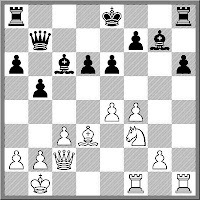 And while it is the mating pattern (Ne5,d5 Bf7) that correctly defines Legal's mate, the idea of breaking the pin with a surprise Nxe5! at least puts it in the same ballpark. Here is from last month where White offers the queen a la Legal and after the offer is accepted, mates in a different, but just as pretty, way. One advantage older chess players have over juniors is that when they first meet, the junior player is often not yet the player they will become. By beating the 'newcomer' at the earliest opportunity an older player can often establish a psychological edge that proves useful in future encounters. Now in the following game I'm not saying Caruana is a newcomer (he did towel up Adams at the last Olympiad) but I'm sure that Shirov was keen to demonstrate that the older generation isn't moving out of the way just yet. Occasionally I trawl my database for games that have a 'special' quality. I'm not looking for the brilliant mind you, but the bizarre. And I cam across a game that fits the bill nicely. It is quite probably the most one-sided win ever (with the black pieces. I didn't do a search for similar wins by White). 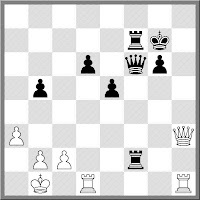 By the end of the game Black has captured everything of White's army, bar 4 pawns and the King. In return he has lost exactly nothing. Now of course this game could be entirely contrived, given the weird opening play from both sides, but even composed games deserve the light of day. Once again being positioned on the other side of the globe means that good chess action is occurring in the middle of the night (Canberra time). The Corus tournament has just begun, with the tournament website covering all the games from the top 3 sections. However with the 11:30 pm starts, I'll be getting a little opening theory, but probably not much else (eg Tiviakov v Carlsen is a Ruy Lopez Worrall, which I played very early in my chess career). Late night coverage of European sporting events is something that we in Australia are probably used to. In fact during the 2002 Football World Cup (Japan/ Sout Korea) Lex Marinos commented that he wasn't used to viewing soccer at 7:30 in the evening, so he would video tape the game, then get up at 4:00 am to watch it. No sooner than the Australian Championship finished, than the Australian Junior Championship got underway in Hobart, Tasmania. Indeed there was a bit of a rush from the Australian Championship as players,parents and coaches who were involved in both events caught evening flights from Sydney to arrive in time for the start of the tournament. Two rounds have been played and there have already been some upsets. Of course junior ratings can be unreliable, and what seems to be an upset may not actually be one (especially in the younger age groups) but IM James Morris's hopeful claim of scoring 11/11, given in an ABC interview quickly came unstuck with a second round loss to Anthony Milton. ACT players Yi Yuan, Andrew Brown and Alan Setiabudi have all began well with 2 wins from 2 games. Tournament coverage can be reached via the Tasmanian Chess page, with a direct link to the results here. In the latest copy of Chess magazine there is a review of a book on blindfold chess, called Blindfold Chess, by Eliot Hearst and John Knott.In the review is quote from Kasparov about why he doesn't play Melody Amber. 'I don't want to become mad!' is his explanation, possibly echoing the claim that Pillsbury had a breakdown caused by too much blindfold chess. (Of course it is now believed that Pillsbury suffered from syphilis instead). In the review there is also a game snippet from a blindfold simul that Kasparov gave in 1985 where he crushed a Mephisto 6800 chess computer. Here it is in full, and it is quite spectacular. GM Zong Yuan Zhao has one his first Australian Championship with a phenomenal 10/11. This is a record score in this event, tying the mark previously set by GM Daryl Johansen. He scored 9 wins and 2 draws (to GM Gawain Jones and FM Vladimir Smirnov), while playing every player who finished in the top 10. He had a performance rating of 2772, which moves his FIDE rating close to the 2600 mark. In second place was IM George Xie on 9/11, achieving a GM norm. In fact he scored the norm as soon as the round 11 pairings were officially announced, as his opponent Stephen Solomon had a high enough rating to lift the average rating of opponents for George above 2380. This was a good thing as Xie repeated a line that brought him success against IM Gary Lane in round 9, but against Solomon it had the opposite result. GM Gawain Jones took outright third on 7.5/11 after defeating Canberra junior Yi Yuan. This left Yi back on 50% (5.5) but as in any swiss, there are 50%'s and there are 50%'s. In Yi's case he played 4 IM's and a GM and performed at 160 points above his rating. The best performed Canberra player however was Junta Ikeda. He went very close to his first IM norm, but a last round draw with GM Daryl Johansen still left on 6/11 (+5=2-4) and a performance rating of 2400. The record score in an Australian Championship is 10/11 by GM Darryl Johansen. There is a distinct possibility that this record will be equalled tomorrow, by not one but possibly 2 players. GM Zong Yuan Zhao and IM George Xie still share the lead with 9/10, 2.5 points ahead of third place. Zhao plays FM Tomek Rej while Xie is up against IM Stephen Solomon. The pairing for Xie is doubly fortuitous in that not only does Solomon bring the average rating of Xie's field over 2380 (after he drops his wins against his 2 lowest opponents) but 7/9 is enough for a GM norm against this field, so he doesn't have to decide between playing to win the title, and playing safe to gain the norm. Live coverage of the final round starts at 11:00 am and can be seen at the official website. I was going to subtitle this post 'some funny results' but after the Australia v Pakistan Test Match in Sydney, the use of the word 'funny' might have carried the wrong connotations. So I'll stick with 'interesting' especially given the standings after round 9. Basically it is Zhao and Xie on 8/9 and everyone else playing a different tournament. In fact the rest of the field is battling for 3rd place at best, as the leaders are now 2.5 points ahead of the pack, with 2 rounds to play. There were some interesting games played this round, none more so than the clash between Junta Ikeda and Vladimir Smirnov. A win for either player would mean an IM norm, so as fate would have it, they drew. This left both players half a point short of the norm score, and means that they need to win tomorrows game to secure a 10 game norm. The main point of interest was whether Ikeda could find a win in the ending or Smirnov hold the draw. In the diagrammed position Ikeda went for one last trick with 78.Nf6+ Kh8 79.Nxh7 Bxh7 80.g6 Now 80. ... Bg8?? loses to 81.g7# and 80. ... Bxg6?? to 81.hxg6 Kg8 82.g7 so Smirnov played 80. ... Kg8! 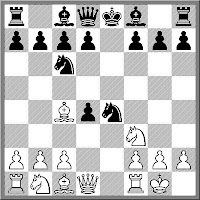 and the games was agreed drawn as after 81.gxh7 Kh8 nothing will shift the King from the corner. There were some interesting results on the Major tournament as well. Jason Hu and David Garner share first place on 7.5/9 after the latter player lost to FM Brian Jones. Jones had applied to play in the championship and was reasonably confident of qualifying as his title and FIDE rating were similar to players who were eventually accepted. However the ACF's discretion in allowing non-qualified players into the championship mainly targets younger players, and so an 'oldie' like Brian missed out. He is now half a point off the lead in the major and a win in this tournament would make it difficult for the ACF to knock-back his application for 2012. As any title norm tournament gets up to 9 rounds, furious calculations begin to see which players may make an IM/GM norm, and what they need to do to achieve it. While modern tournament management software (Swiss Manager or Swiss Perfect) kind of does this, it does so after the fact. So to know if you are playing for a norm usually involves diving into a copy of The Chess Organisers Handbook and hoping the numbers add up. For this years Australian Championship, the focus is on 3 players. Both Junta Ikeda and FM Vladimir Smirnov are both on track for IM norms (with TPR of just above 2450), but they actually play each other in round 9! So it should be a norm for the winner, and more work for the losr (the tournament is 11 rounds). IM George Xie would ordinarily have his GM norm already sewn up, but for one pesky rule. Although his TPR is over 2600 (he is on 7/8) the average strength of the field he has played is below the minimum 2381 required for a valid norm. This is to prevent players achieving the norm by having a phenomenal percentage against a relatively weak field. Of course George can get the average rating of the field over 2380 over the next 3 rounds, assuming the right opponents and the right results. 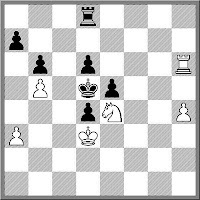 Ironically this was also the rule that prevented then IM Zong Yuan Zhao's outstanding performance (9.5/11) at the 2006-7 Australian Open being a valid GM norm. The problem at the time was that despite the event attracting 4 GM's, the Australian IM's stayed away in droves, with only Zhao and IM Mirko Rujevic making the trip to Canberra for the tournament. Oddly enough, 3 days after the tournament finished, at least 7 IM's* did find their way to Canberra for various duties at the Australian Junior Championship. (And yes, IM George Xie was one of those players). I popped in to the Australian Championships today to catch an hour or so of the action. I had a quick chat with GM Gawain Jones who said he hoped that todays results would go his way, allowing him to catch up. Sadly for Gawain nothing went right for him, with the 2 leaders winning, and he losing his own game against Stephen Solomon. This leaves GM Zong Yuan Zhao in front on 6.5/7, with IM George Xie on 6. A full point back in third place is Junta Ikeda, and then FM Vladimir Smirnov and IM Stephen Solomon on 4.5. The big pairing for tomorrow, in terms of title norms and tournament position, is Ikeda v Xie. A win for either player would certainly mean a norm (IM for Ikeda, GM for Xie) and allow them to keep touch with Zhao. Quick blogging today as I have been on the road. A quick trip to Sydney to catch tomorrows action at the Australian Championships (amongst other activities). Had a quick read of the results from Round 6, and note that Junta Ikeda is still on track for an IM norm. Unfortunately this was at the expense of fellow ACT player Yi Yuan. Tomorrow Ikeda plays IM Gary Lane, and a win would see him well placed for both an IM norm and a high placing in the championship. The other day I was having a discussion with FM Brian Jones about the 'Career Player'. This was a concept that I had probably thought about over the years, but had never formalised. The way Brian defined it was that a 'career player' is someone who will become a long term chessplayer, even if they don't make a living out of it. As an example he thought that Max Illingworth will be a 'career player', while others of his generation may not. In doing a little research on the topic, I had a look at past winners of the Australian Junior Championship. Why I chose this sample set is due to both the fact that if a group of players 'should' stick at chess, it is those that are quite successful at it, and that I was aware that a number of winners of this title 'retired' almost immediately after winning it. Basically over the last 30 years the retirement rate is about 50%. It has been pretty constant over that time, with 4 winners in the 1980's still active, 5 winners in the 90's still playing, and surprisingly, only 5 players who won the title in the last 10 years still playing. Will any of these players come back? I doubt it, simply because to walk away like this indicates that you aren't playing the game simply for enjoyment, but for other rewards. And once those rewards were achieved (or became unachievable) it was time to go. The World Team Championship is kind of like an uber-Olympiad, where the leading teams get to play without having to bother themselves with the riff-raff. Well that was the intention when it was set up, but it has never quite achieved that aim. The 2010 edition is under way in Turkey, although there are already problems with the event. The teams that qualified to play were the 4 Continental Champions (Asia, Europe, Africa and the Americas) , the top 3 teams from the last Olympiad, the host country, and 2 invited teams. There has been some complaints about the fact that Ukraine was not invited (as it was high finisher at the Olympiad), but I think it is more significant that Armenia, Israel and Greece (who were invited), are all playing, given the historical difficulties between Turkey and each of these countries. Indeed the only country who should have played but didn't show was China, and this snub was apparently political. While the event may not be as important as originally hoped, it did have one significant effect on the Chess Olympiad. In the 2005 tournament Russia was trailing going into the last round and needed a 3.5-0.5 win over China to take gold. It of course did this, and this result is one of the reasons that FIDE moved from game points to match points for the 2008 Olympiad. More comprehensive coverage of this event, including the format/composition issues can be found here at Chessvibes. Junta Ikeda has won the 2010 Australian Lightning Championship, after defeating Moulthan Ly 2-0 in a playoff match. The playoff was actually between the 2 players who tied for 2nd in the tournament, as the tournament winner, GM Gawain Jones, is ineligible for the title. This is the 2nd national lightning title for Ikeda, who previously won the lightning event at the 2006-07 Australian Open (as well as winning 2 Australian Junior Lightning titles). With the rise and rise of Magnus Carlsen, it is inevitable that he will be increasingly compared to Bobby Fischer. Both age and style are points of comparison, although Carlsen has already stated that he is unlike Fischer in some important areas (obsession and mental stability). With Carlsen doing a feature interview with Time Magazine, I'm sure there will also be comparisons between his style and the somewhat notorious utterances of Fischer in print. If you wish to make some comparisons yourself, a trawl thorough the archives of Life Magazine (courtesy of google) may assist you. I picked up one story from 1971, where the author had a chat with Fischer. The article is here, and there are a few others if you search. I was planning to comment on the Australian Championship every few days or so, but the round 2 results mean that I will comment for a third day in a row. Having given the three ACT competitors a big plug for their 2.5/3 start yesterday, they did even better today, scoring 3/3. Junta Ikeda defeated last years Australian Open winner IM Aleks Wohl in an interesting game. (When my son saw the pairings this morning he simply said "Junta will win"). Andrew Brown downed his second IM in row with a win over the defending Australian Champion, IM Stephen Solomon. And Yi Yuan moved up to 1.5/2 with a win over Laurence Matheson. Challenging parings await all three tomorrow, with Ikeda up against GM Zong Yuan Zhao, Brown playing GM Darryl Johansen, and Yuan paired with IM Aleks Wohl. The 2010 Australian Championship started this afternoon, with 187 players entered for all major events. There is a big contingent of Canberra players taking part this year, with 3 young players in the Championship itself. Junta Ikeda won his game against the lower rated (although titled) Gene Nakauchi, while Yi Yuan drew with 10th seed Moulthun Ly, and Andrew Brown scored the only major upset of the first round, defeating IM James Morris. In yesterdays post I didn't jump in with a prediction of who I think would win, but a day late I'm tipping GM Zong Yuan Zhao, for both the tournament (and obviously the title). The official website is a little tardy in getting the results/pairings up (and the live coverage suffered the usual first day problems ie it isn't working) but you can get some tournament information from chess-results.com. The Australian Championship begins tomorrow in Sydney. I'm not quite sure whether it is the 2010 Championship (as the website has it) or the 2009-2010 Championship, as historically this event used to start between Christmas and New Years Day, until organisers realised that it made more sense to start it in the new year. In fact the organisers have done an excellent job of attracting a large field with 186 players entering the major events (Championship, Reserves, Minor and Classic). This is big increase over the size of the fields for the last three Championships and Opens. Three GM's are in the field (Zhao, Jones and Johansen), although Jones is not eligible for the title. Live coverage of the games will also be available from the website.